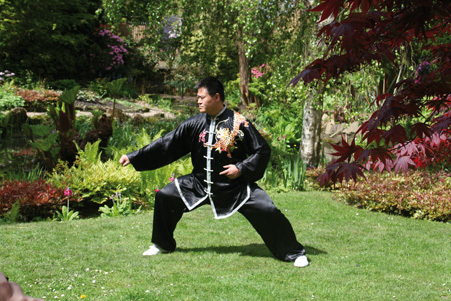 In the first and second parts of this article, published in the Summer and Autumn 2010 editions of this magazine, I discussed what I consider to be the first three of the five most important taijiquan skills for beginners, namely fang song, peng jin and ding jin. In this article I discuss the fourth and fifth most important skills for beginners, Chen and Chan Si Jin. Chen has two meaning in Taijiquan. The first meaning relates to how the body must “sink” to connect to the ground. The second meaning relates to how the qi must be trained to always be sunk down. These two meanings refer to two separate but closely related skills. The skill of “sinking” the body is dependent on the skill of fang song. The joints must remain loose but still coordinated together. The body is allowed to compress, either using the force of gravity or a force applied from another person. This compression must be directed by the body down the leg without causing stiffness. Training the qi to remain sunk is more difficult to describe. The reference to qi is difficult for many people to understand and a direction to do something with qi brings even more difficulties. The dantian (or sea of qi) must move freely first. The qi moves naturally initially. Then, as the qi increases, it must be kept sunk and not allowed to rise out of control, e.g. getting excited or emotional. It must be sunk down to flood the legs and reach the ground. These actions can be felt clearly and unambiguously, in the body and legs, when the body and legs have been trained sufficiently and properly. The combination of these two skills produces a skill that may appear unbelievable, where a significantly bigger and stronger person is unable to push over a smaller, weaker person; where someone on their back leg can simply push backwards someone opposing them on their front leg. However it is a basic skill which can be understood and developed with the correct teaching and considerable practice. Through the skill of chen, incoming forces are directed down the legs to the ground and conversely outgoing forces are generally pushed from the ground. It requires a mobility in the hips and waist that is difficult to describe and comes from long and hard training in the correct manner. A student must be led to it by a teacher who not only understands the skill of it but also the skill of how to teach the skill. For strength to be connected to the ground it must first sink to the ground. In this respect chen is closely related to peng. Without a well developedpeng jin, including a mobility of the dan tian a well developed chen or root will not be possible. The outgoing force which pushes from the ground is not something mystical but the result of careful training, a coordination of peng jin, a certain type of leg and body strength and control. The body acts like a highly specialised and controlled spring. When it is compressed, the pressure goes to the ground and when it is released it pushes from the ground. A good root is essential to neutralize and release strength effectively using the internal method of Chen style taijiquan. Understanding and developing a root is initially developed in standing (zhan zhuang) practice. Through correct standing practice peng jin and ding jin are developed along with balance and an understanding of qi. Training the body and qi to sink and remain sunk under pressure is a major focus of taiji forms. In the beginning moderated and slow movement allows the quickest route to understanding and increased skill. Closing the body during practice, the elbows to the knees and the shoulders to hips, helps develop the understanding of chen. Sinking at the start and end of each movement is part of the process of developing chen. Practicing with longer and lower postures and relaxing the upper body and hips develops the leg strength that is fundamental to developing a strong root. More importantly, loosing the body (fang song), particularly the hips, so your qi naturally sinks to the legs and feet, helps develop a root. The intensity of practice and the strength required increases significantly as the qi sinks more to legs and a person’s root develops. 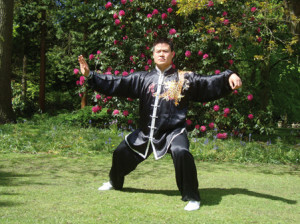 After the skills of fang song, peng and ding are understood in the body and the mind, specific rooting exercises can be used to aid the development of chen. When rooted under pressure, the feeling is that the joints redirect in a downward direction and the joint itself may move down slightly. It should not be mistaken for crouching down or simply bending the joints. To crouch down low usually provides improved mechanical leverage and requires greater leg strength. The mistake of lowering the body is frequently mistaken for sinking. A lower stance will strengthen the legs but not necessarily develop the root. Initially the skill of chen is trained in a more upright position as it takes more skill to be lower and be rooted than to be more upright and rooted. The type of motion required in taijiquan is called silk reeling or chan si. Although I list it as the fifth most important skill for beginners to pay close attention to, without chan si jin there can be no taijiquan. Chan sidescribes how the body must move to move the qi, to maintain peng jin and to co-ordinate the constant opening (kai) and closing (he) of the outside and inside of the body that taiji is composed of. For the beginner chan si gong can be considered the early training of taiji shen fa (body mechanics) in movement. By following the relatively simple choreography, in a progression from simple to more difficult, (first with one hand and then with both hands, first stationary then with steps,) the beginner will find how the body moves in circles and spirals. For the beginner the internal movement is not important. Paying attention to winding in (shun chan) and winding out (ni chan,) front circle (zheng mian) and side circle (ce mian), and normal direction (zheng) and reverse direction (fan) is sufficient. Try to move smoothly and without stiffness. Gain the skill of fang song by removing the blockages caused by stiffness in the joints. Aim to get all parts of the body to move in a circle and spiral. This form of spiral movement not only appears on the surface of the skin, but also appears inside through the whole body. It causes every joint and limb to experience motion. Through repeated coiling and stretching in the training for a prolonged period of time, the body will naturally attain the resilient and elastic strength (peng jin – discussed in part 2) that is loose and yet strong at the same time. 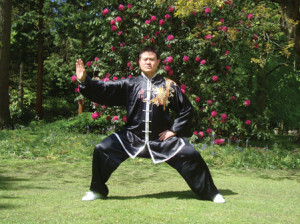 Chan si jin is the method that the body uses to move so as to retain peng jin. In the mid 1980’s teachers from Chen Village, notably Chen Xiao Wang and Chen Zheng Lei, as well as others created silk reeling exercises (chan si gong.) These exercises were derived from important movements in the training forms to aid in the development of chan si jin. It became well established quickly as a means of teaching larger groups the basic grasp of movement in Chen style taijiquan, particularly helpful for those without regular access to direction and correction from a good teacher and whose practice time is too short to allow progress in understanding to be made immediately through the traditional forms. Although these sets of exercise may look different from teacher to teacher, they all train the same set of principles. In summary, over these three articles I have described the five most important skills at the foundation of taijiquanfor beginners. My hope is that those who wish to understand and gain the skills of taiji will be aided by these descriptions. In Chen Style we say there are three requirements needed to gain gongfu. A good teacher, good understand and good practice. History has shown that all who have achieved a high level of skill had all three. These articles aim to help in understanding what taiji is and what its skills are. Gongfu may be translated as skill, but the idea of time spent is a more useful translation. In Chen Style Taiji the yilu (first form) is the foundation route taken by all those who have reached the third level. While the erlu, weapons forms and push hands form an integral part of the training, too often students reach for these before the basic skills which they utilize are established. Without developing the basic skills of fang song, peng jin, ding jin, chen, & chan si jin, progress will be limited. In my own training with my teacher Chen Zheng Lei, these ideas were not explained to me in a theoretical way, but arrived at after long practice with regular correction and derived from experience. These were not ideas we first discussed but principles that grew out of my practice and the repeated correction from my teacher. It is important that the student understand this and not neglect their practice. In the beginning, training taijiquan is like paddling upstream: as soon as you stop paddling you will move backwards. So train steadily and without a break with a good teacher and progress will come to you.